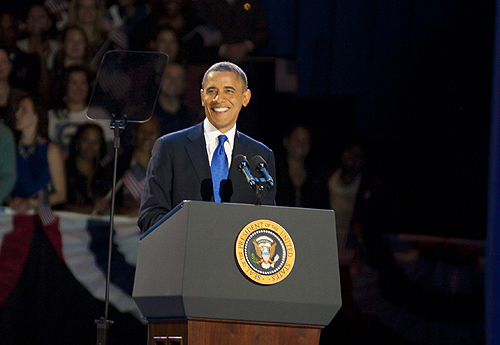 President Obama is all smiles during his acceptance speech. Editor's note: The Red Line Project's Brianna Kelly and Ryann Rumbaugh shot photos, video and tweeted during Obama's watch party at McCormick Place. Here, they write about what that experience was like. Much like Americans didn’t know what the outcome of the election would be, we as reporters had no idea what we were getting ourselves into when we arrived at McCormick Place for the Obama Election Night rally on Tuesday afternoon. After battling cold, rainy weather and rush-hour traffic, we reached the Soldier Field South parking lot and the first Secret Service checkpoint. After agents and bomb-sniffing dogs searched our car, we parked and ventured into McCormick Place. After going through a second set of Secret Service checkpoints, the building opened up into the press center – which was laid out much differently than the NATO summit back in May. A few obstacles stood in our way – weak wireless Internet and minimal access to the main stage. Entrance to the main risers was granted to the predominant media corporations that could afford the hefty fee. The main media center was placed in between the main riser and the bleachers where Obama supporters sat – basically, we were wedged in the corner with little to no visibility of the stage. Most members of the media had to watch the rally from the big screen, instead of witnessing the action firsthand like they were hoping to do. A limited amount of riser space was available, so the press center became a free-for-all as the night progressed. Reporters and cameramen resorted to standing on tables and chairs while struggling to get their shots. However, the chaos and disorganization ended up working to our advantage. The organizers of the rally allowed the news organizations to send their photographers and reporters into the press pit for two measly minutes. It was extremely frustrating because they were rotating us into the actual rally space before the main event. The Red Line Project’s writer and photographer, Brianna Kelly, was put on a list so she could have access to the media area beginning at 8 p.m. When her name was called, she stepped forward and was handed a piece of paper that read “Buffer” on the top of it. She didn’t think much of it at first and simply stuffed it into her pants pocket. She attempted to take photos of the crowd, wondering what she could accomplish in two minutes, when she noticed that a small handful of other photographers had the “Buffer” paper in their lanyard, so she slipped hers inside of the lanyard around her neck. When the two minutes were up, the rally organizers began kicking some of the media out of the pit. But no one asked Kelly to leave, so she decided to stay as long as she possibly could. At first she just thought she was doing a good job blending in—maybe it was due to her massive telephoto lens that was attached to her camera. But she slowly realized that all of the photographers that were allowed to stay throughout the whole rally had the extra “Buffer” pass. Kelly realized she was incredibly lucky that she was handed the pass and decided to stay in the press pit for the long haul, by standing for five hours to wait for the rare opportunity to photograph the president. Around 7 p.m. Obama's supporters began filing into the McCormick ballroom. 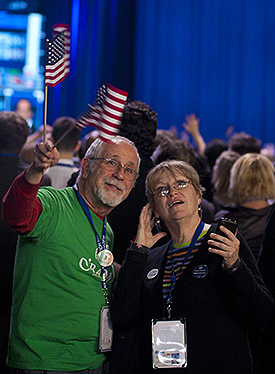 As projections began to come onto the jumbo screens, people cheered as Obama took the early lead of a state. About an hour later, hundreds more supporters made their way in. The feelings in the gargantuan room were tense, as the race was initially very close, with Mitt Romney ahead by less than a dozen electoral votes. The crowd erupted and waved little American flags as he was projected to win many of the key battleground states, including Iowa, Ohio and especially Paul Ryan’s home state of Wisconsin. Once Obama claimed New York, Pennsylvania and California, he took a substantial lead. Before 11 p.m. it was clear that the president would be re-elected. Much celebration took place into the wee hours of the night. An impressive soundtrack, featuring old favorites and newer hits, blared throughout McCormick Place. Obama supporters hugged, high-fived, danced and sang along with the music as they waited to witness the president’s victory speech. Romney’s concession speech aired and the crowd cheered and clapped loudly as he extended his congratulations to Obama. Excitement was in the air because the audience knew it would soon be time for him to take the stage. But instead of the victory speech immediately following the concession speech, the president decided to make us wait a little longer. A very inspirational video featuring Edith Childs, who inspired Obama’s “fired up, ready to go” catchphrase of the previous election, showed how one voice can truly made a difference. view of the press center at the Obama watch party. The red curtains on the stage then opened to reveal a riser full of people waving those famous little American flags. The music began again and everyone was dancing—and dancing, and dancing. The crowd began to grow impatient as one song after the other was played. Some people even sat down on the floor. Everyone was wondering when Obama would finally make his appearance. Shortly before 1 a.m. on Wednesday morning the music finally stopped and a voice introduced the incumbent candidate, the 44th President of the United States. Everyone got back on their feet and went wild as the Obamas walked onto the stage at McCormick Place, hand-in-hand. Michelle, Sasha and Malia smiled and waved at the crowd for a couple minutes before they returned backstage to allow the president to address his thousands of supporters at the rally and the millions more watching at home. Seemingly everyone in the audience held their cell phone in the air as they captured Obama’s eminent rhetoric. Obama began by thanking all of the people who helped him throughout his campaign for re-election. It was obvious that the crowd was filled with many Obama for America volunteers by the roaring cheers that were produced when he mentioned phone banking and canvassing. Throughout the 20-mintue speech he also touched on global warming, education, immigration and of course, the economy. Experiencing Election Night at Obama’s rally allowed each and every attendant to feel like they were a part of history. It was an electrifying evening that inspired goose bumps and tears of joy on several occasions.